A 43-year-old man has been charged in connection with a bomb hoax at a Birmingham hospital. 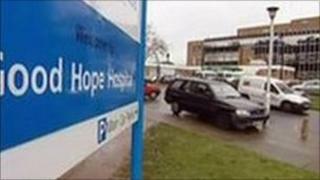 A suspicious package was found in the toilets of the accident and emergency department at Good Hope Hospital, in Sutton Coldfield, on 23 November 2010. The department was evacuated and police closed a number of roads in the area. A police spokesman said a bomb disposal team carried out a controlled explosion and the package was found to be a hoax. The hospital re-opened later in the afternoon. The man was charged on Thursday and is due to appear at Sutton Magistrates Court on 17 February.